Eurocircuits supports your Electronic Student Project ! Why and how does Eurocircuits support your Electronic Student Project? Eurocircuits is fully committed to help and support European electronics students with their Electronic Student Project during their academic careers, after all they are the future of the European electronics industry. Today, students set up a specific legal entity to run their educational projects which are effectively being managing a real business. Eurocircuits seeks to form a WIN-WIN partnership with these entities by supplying the bare PCB’s for the project and purchasing advertisement from the Team. First the Team must establish a budget for the bare PCB’s required for their project. This is easily be created with by using the Eurocircuits calculator. the Team sends this detailed budget to Dirk Stans including a full description of the Teams’ project and ambition. All the details about the Teams’ legal entity and relevant contact details must be included. An overview of what is required is available here. At the same time the Team sets up a Eurocircuits customer account, ensuring that all the correct details of the teams’ legal entity are included along with details of all necessary contacts. Teams can also take over the customer account of their predecessors and adjust the contact details to the present situation. The Team manager for the electronics together with Dirk Stans will then discuss the budget and agree on the budget available from Eurocircuits for the project (amount in Euro excluding VAT). The Team is then able to use its online Eurocircuits customer account as with any other Eurocircuits customer. 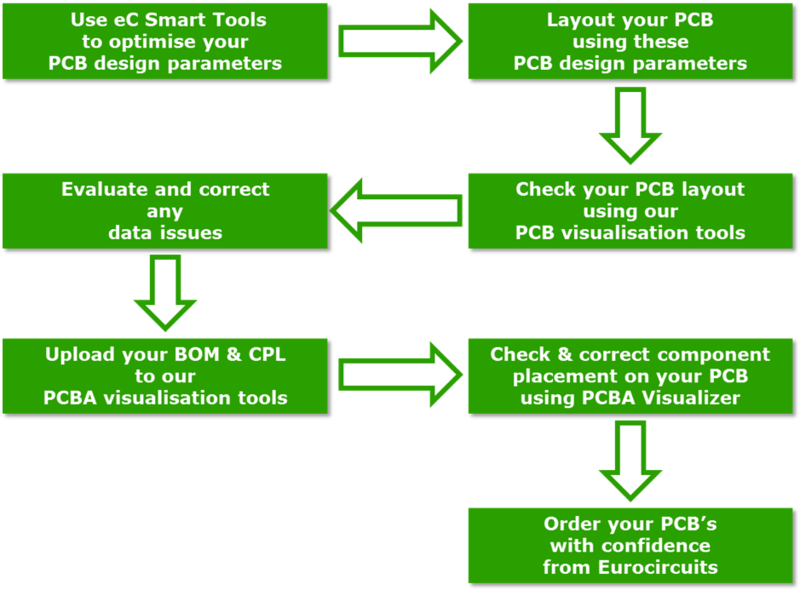 Using the Eurocircuits account, the Team processes their PCB files through the PCB Visualizer ensuring that it meets the Eurocircuits manufacturing criteria. If the design meets the criteria then it can be checked out and ordered. When the PCB’s are received the invoices must be paid in a normal way. … the story continues here. S.M.A. NV, Tennislaan 1, 2400 MOL, Belgium, at the attention of Dirk Stans. All BLOGs will be published on the Eurocircuits website and on Eurocircuits social media to. In the Eurocircuits NEWS letter they are mentioned and linked in their dedicated section of the NEWS letter. So there will be a lot of exposure for the Team as well. Let’s have fun making electronics with future engineers. Eurocircuits profile that can be used. Eurocircuits are specialist manufacturers of prototype and small batch PCBs. We are dedicated to providing a PCB service that will help PCB designers bring their projects to market on time and on budget. We produce prototype and small batch boards in our specialist factories in Germany and Hungary. Set up in Belgium in 1991, today we employ around 400 people in Belgium, Germany, Hungary and India, plus sales companies in France, Germany and Switzerland and sales offices in Italy, Spain and UK. We currently produce more than 109,000 orders per year for almost 20,000 users ordering for more than 12,000 active customers. LOWERED COSTS. Our order-pooling pool technology cuts our manufacturing costs and gives you lower prices. And we provide online design optimization tools which guide you towards lower cost design solutions. ONLINE PRICING AND ORDERING using our fast and easy to use smart menus, accessible 24/7. Get an immediate price without losing time while a sales office “gets back” to you. Place your order with confidence that the price is right and there are no data issues to delay delivery. How? The smart menus automatically check the board parameters in real time as you enter them and flag up any cost or manufacturing issues. Then upload your data into the PCB Visualizer online checking tools, within a few minutes you will see on screen any production issues. ONLINE TOOLS. As part of our knowledge-sharing and support programs we offer an ever-expanding range of free online tools. These include design-optimisation tools, data-checking tools, smart menus with the build-up wizard for multi-layer PCBs, and tools to fine-tune your order without losing CAD time (Panel editor, Marking editor). While preparing to launch your PCB order you can introduce the Eurocircuits logo on the PCB by making use of our marking editor. How to use the marking editor found here. The Eurocircuits logo is already in as a feature and does not have to be loaded. So just click it as indicated in the image here and the EC-logo will appear on your PCB. You can then move it to the position of your choice.